With a few colourful strokes of paintbrush, a housing society’s wall was turned into something that its residents could positively identify with. The vibrant spirits of communities that had long been overlooked were now visible to the public and impossible to ignore. Artist Dattaraj Naik has painted one of Goa’s biggest football-themed murals that depicts the state’s undying passion. It depicts their love for the sport through the eyes and aspirations of a child. A multi-disciplinary artist hailing from the eponymous state, Naik’s mural features a boy sitting at a study table while dreaming about playing football. The mural represents a common situation amongst the school children in Goa who try to keep a balance between academic studies and their favourite sport, football. It brings forth the dreams and aspirations of young children who want to get out on the field but are held back due to forced pressure of academics and other circumstances. Naik said he was trying to understand the space before beginning the artwork. He noticed the schools around and spent time interacting with the students. “At the same time, I wanted to somehow relate the art to football,” he disclosed. And thus, came the idea of depicting how many Goan youngsters try to balance academics with their favourite sport. Naik stated that he also made use of the placement of the building to portray the mural in a particular way. “If you look at the building from afar only the upper part of the building shows the boy at the study table. As you go closer to the building, you can then see that he is dreaming of football, with a football under his feet,” said Naik. “I wanted to do something like this in Goa since a long time,” he added. 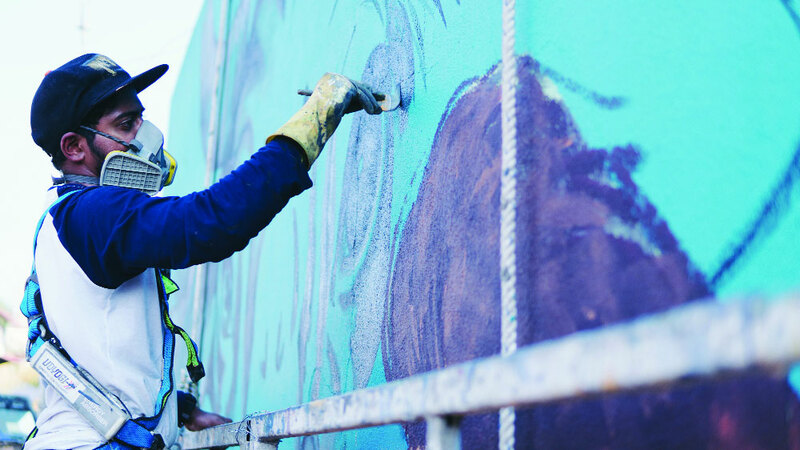 In communities across the globe, individuals have been using street art to transform dull parts of a city into vivid representations of local identity and culture. In some cases, graffiti artists employ themselves as the voice of the voiceless, leaving behind works of art filled with important political and social undertones. In other societies, members work together to create large murals that instantaneously brighten the whole city. Street art is used as a means to expose community characteristics that would otherwise remain hidden beneath the surface. The mural is a collaboration between FC Goa and the St+art India Foundation. Naik stated that in a way he could relate to the artwork himself. “When I was in school I used to enjoy football. I also played for my school and college team,” said the artist. Although he has moved to art now, he still manages to make time for football.